Handy for bloggers and bloggers-to-be. Thank you to MyBlogGuest for being a Silver Sponsor in The 6th Annual JobMob Guest Blogging Contest, the second year in a row that they've sponsored the contest. Please support them too! If you need help creating quality content for your blog (or a client's), or want exposure by guest posting on other blogs, MyBlogGuest is a must-use platform. There comes a time when even the most successful blogger has to admit that they need a boost. Whether it is in reputation management or branding, content can only get you so far. To really make an impact, you need to have a platform from which to expand and grow, something best accomplished through networking. Why is that? Networking with other writers or blog owners, and sharing content between the two, is a quick shot in the arm for any blog. It drives new traffic, connects you to a new reader base and can even just give you a much needed break when you are burnt out blogging. MyBlogGuest is a network of writers and blog owners for guest posting. Many bloggers find that looking for guest contributors is quite a difficult task, even if they have an active blog with a following. MyBlogGuest noticed that same trend and did something about it- they created an Article Gallery where writers could post completed articles to be published on other sites. All within easily searched categories, under tags. Bloggers can then sign up and search through the gallery. If they see something they like, they make an ‘offer' to the post writer. This has nothing to do with cash, as all content is free. Instead, the blogger shows the writer a link to their blog and proposes a date to publish their writeup. All the blogger needs to give in return is a byline. Bloggers can also post article topics you want written (i.e. article wanted ads) in the MyBlogGuest forum. Writers then make offers to write up the topics with the same conditions, giving bloggers a secondary way of getting just what they want. 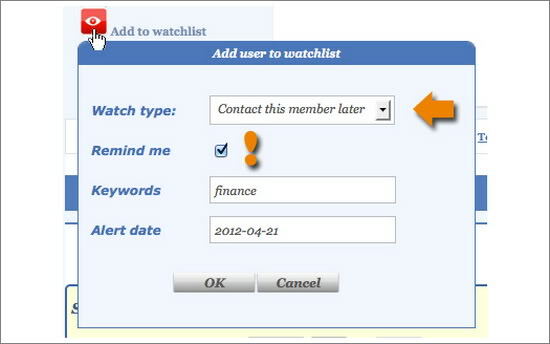 Pictured: using the watchlist feature to stay alert of offers in your topics of expertise. MyBlogGuest is not a magic bullet. It doesn't automate writing and submitting articles (only scaling and organizing is automated) because MyBlogGuest community is all about a *high-quality* approach to guest posting. It all comes down to how actively you use the site. If you try out a few offers and test a few writers and their articles, you'll eventually find great partnerships that would have taken much more work and effort to find elsewhere. For more about the site's benefits (and relevance to job seekers! ), check out: Gerald Weber: MyBlogGuest is Guest Blogging on Steroids. Subscribe to JobMob via RSS or email and follow me on Twitter for more tools you can manipulate for your job search. The more I learn about this, the more I like the idea of participating.